Hey there! 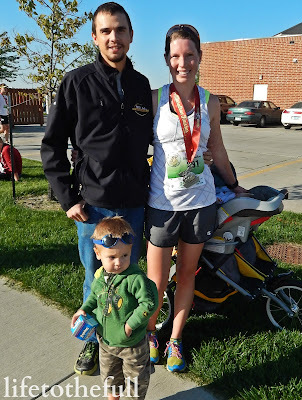 We're back after a fun weekend away as a family and I've got a race recap to share with you. After an "unplugged" week, I'm joining up with Jessica and Jill at the Fit Dish link-up. The week was wonderful but it's nice to be back! We traveled to the race on Friday evening, picked up my race number and went out to eat with a friend at Noodle's & Co. It was a nice night... minus super cranky children. Baby W cried from Noodles & Co. until we made it up to our hotel room. And then cried some more. E was beyond tired. Leo and I both agreed that we should never leave our home with the boys again. 5:30 AM - My morning alarm came way too soon! I was thankful to have a decent night's sleep with E sleeping through the night and Baby W only up a couple times to nurse. First things first, I pumped and prepped a bottle for W and put on my race clothes. 6:00 AM - E was awake so he came down for breakfast with Grandma and me. I had a blueberry bagel with peanut butter and honey plus some apple juice. My race morning nerves tend to suppress my appetite but I knew I needed to eat as much as I could (within reason). 6:30 AM - Time to go! After saying my goodbyes and taking a quick picture with E (and a pair of socks), Grandma and I were on our way to the race. Grandpa and Leo hung out with the little guys in the hotel room. 7:30 - We checked out the starting area and then my mom (alias "Grandma") dropped me off at the sports arena. I wandered for a while, watched the sunrise, jogged a little, ate my first GU (vanilla bean, of course!) and then headed off to the starting line. God blessed us with such a beautiful sunrise that morning! I was thankful to be able to take the time to watch it. 7:45 - The half marathoners, relay teams and 10k runners all lined up. I found my way to the 1:40 pace group and announcements and anthems started soon after. 8:00 - And we're off! As the mob of runners spread out, I ended up with the tail end of the 1:35 group. 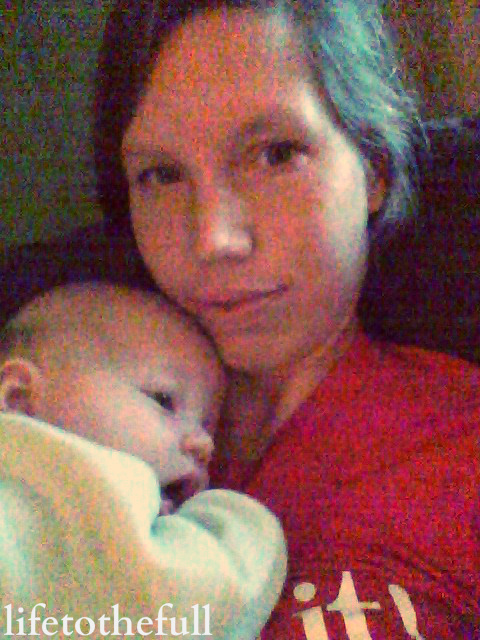 I did my best to hang with them in last year's Wild Hog and I knew that wasn't a realistic goal at 4 months postpartum. Even in the first mile, I could tell my body was just worn out. I did taper from running in the week prior but life itself just wore me out. For every race, I write a Bible verse on my arm to help me keep perspective and Ephesians 3:20 had been on my heart that week. My energy tank was running low but I knew that God could give me the strength to run my best race - He can do so much more than we dare to ask or hope! I was feeling good and the miles were passing by quickly now. Just before the next aid station, I took part of my second GU gel. My stomach wasn't really feeling it but I had to eat it now to prevent running out of gas in the last third of the race. Racing while I'm nursing our youngest has forced me to eat and drink more than I used to while training and racing. My goal was to maintain sub-8:00/mile. It was tempting to speed up and chase after the runners racing by me but I couldn't maintain a faster pace all the way to the finish. Many of the runners breezing by at that point were relay runners with fresh legs, as the faster half marathoners had already pulled away from the mid-pack, but my mind still wanted to chase. "Stay in your own lane!" This was something Leo and I had talked about earlier this week. While there aren't any "lanes" in long distance running, his words reminded me to run my own race rather than comparing myself to the other runners. We were talking about spiritual growth rather than running but it applied to both. "Stay in your own lane" means guarding yourself from spiritual pride and comparing our faith walk with someone else's. Because we do this or don't do that doesn't make us "more holy" than someone else and God doesn't "love us better" than someone else. We are saved by grace alone not by anything we say or do. In both running and our walk with God, we can give our absolute best effort and be satisfied with that. We can experience so much freedom when we choose not to compare ourselves to others! 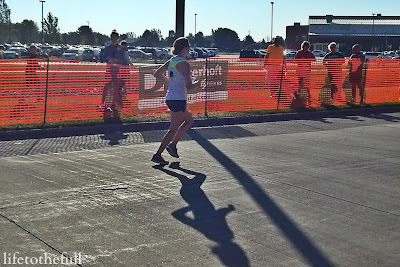 When the race clock was in sight, I had a couple more seconds to finish sub-1:40. So I sprinted... and thankfully I didn't trip over my own feet because the home stretch was lined with people watching. As it turned out, I beat the 1:40 mark by 2 seconds. That last kick made all the difference! The assembly line after the finish was a smooth one lined with pineapple, pretzels, oranges, chocolate milk, and other goodies. I was given my medal and grabbed a water bottle and some licorice before finding a spot to sit down in the grass. This was Leo's first time watching me race and it was so special to have him there! Baby W was asleep when I met up with them and E was very distracted by all of the race chaos going on. The Wild Hog Half Marathon's race "swag" is awesome. The BornFit® long-sleeve zip-up shirt and the FitSocks are my favorite! Overall, the race went better than what I expected 4 months after W's birth! Leo, the boys and I picked up drive thru sandwiches from Erbert's & Gerbert's and coffee. We headed back to eat, shower and nap time for the kids (and parents!). 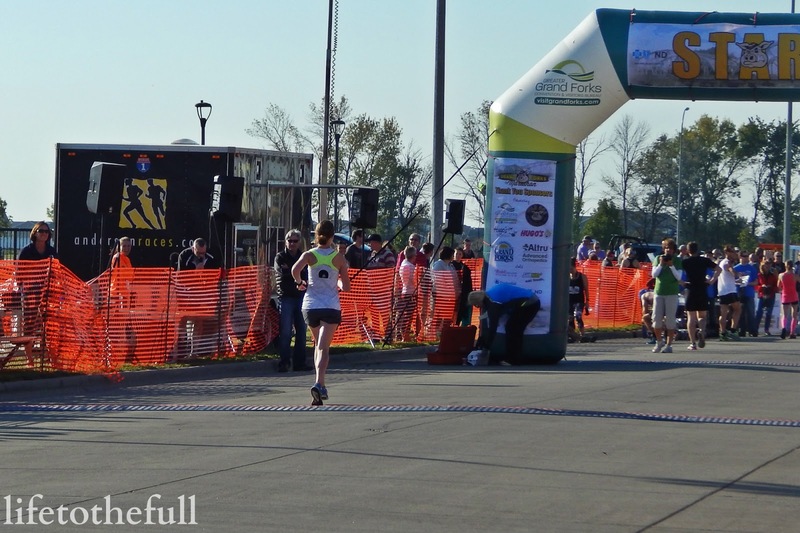 What is your favorite half marathon and/or full marathon? There is something I love about this almost-Fall morning. The cool, crisp air makes 42°F feels refreshing, my coffee is still a lukewarm, and it's Five-Minute Friday! Win, win, win! My best friend came over for a visit yesterday and we had a wonderful time catching up, reminiscing and laughing. Over the past four years, we have changed so much. It seems like nothing is the same. Marriage, moving away and two kids make it hard to recognize the "me" in the pictures from four years ago. Months have passed yet our conversation starts off right where the last one ended. There is never a dull moment. While we both have changed so much, something about our friendship stays the same through it all. A true friendship that sticks together through all the changing seasons of life is hard to find. It is a treasure and I am so thankful for ours! Our friendship is a reminder of my relationship with Jesus. This world is changing - and not for the better. Yet Jesus is the SAME. He hasn't changed and He never will. Jesus is our Rock and our Refuge. Throughout the turbulence of life, we can count on Jesus to be by our side through it all. He is with us and His promises stand the same yesterday, today and forever! Hope you're all having a fine Labor Day weekend! I'm sharing this Training Week 9 update with the Fit Dish and Faith & Fitness link-ups. Week 9?! Only three more weeks until race day... and the end of September. I hope Fall sticks around for a while. It seems so short while winter seems so very, very long. Our verses for this week are from 1 Corinthians 9, where Paul is teaching us about our need for self-discipline. When I was thinking back to my college tennis days, I noticed that my coach had a purpose for each practice. Some practices we focused on serving, others volleying, practice matches, ball machine, sprints, timed miles. You name it. We arrived at the courts and coach had a plan. My daily tennis-playing days are long gone but the same concept applies to long-distance running. 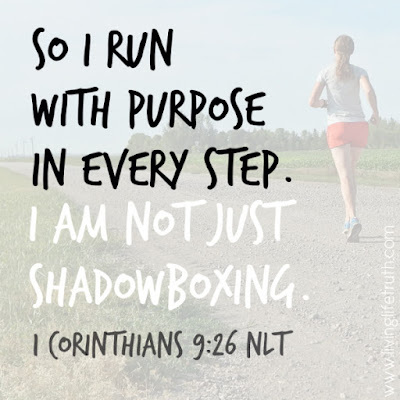 Each day of running has a purpose! Easy, recovery, long, tempo, speed-work, hill intervals, strength training. It is possible to run without a purpose, but major growth doesn't happen when you run aimlessly. 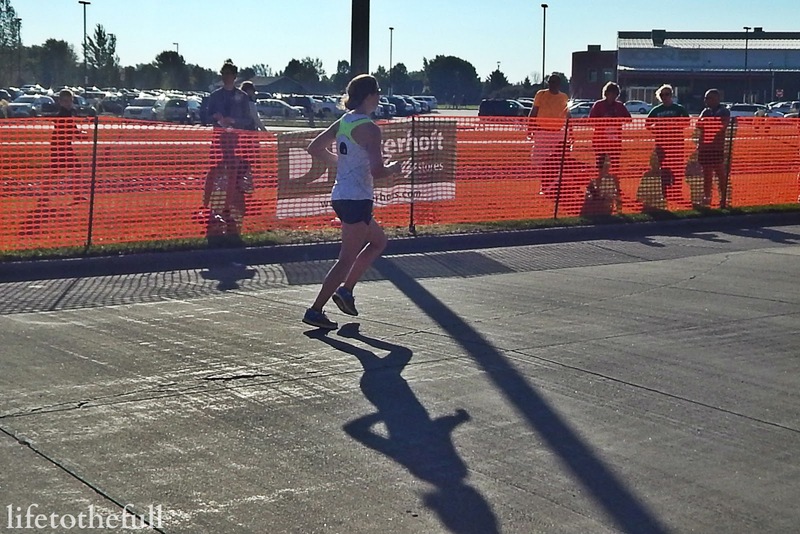 When I first started running marathons, I paid little attention to varying my workouts. I threw on the shoes and headed out the door. While I did cover the miles, without the speed-work, my speed didn't improve and, without the recovery days, my muscles didn't have time to recover. 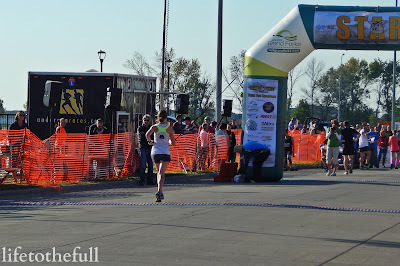 After my last marathon, I was burnt out! Since learning to run with purpose, I have felt more motivated to hit the workouts and my running has improved so much compared to the plateau I was on before. As Paul writes in 1 Corinthians 9:24-27, our spiritual growth requires training with purpose, just as athletes train for competition. Opening your Bible every morning is a great starting block - but what's next ? I want to dig deeper! Tie up your laces and run your life with purpose to win the eternal prize. 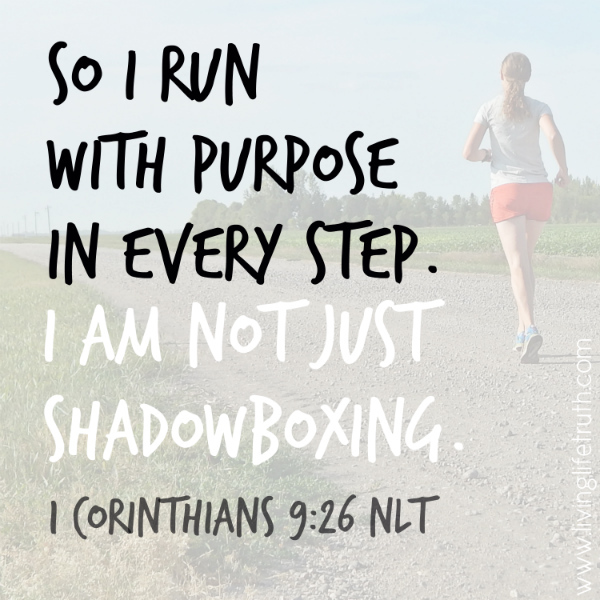 How can we run with purpose in our faith? Do What God's Word Says. 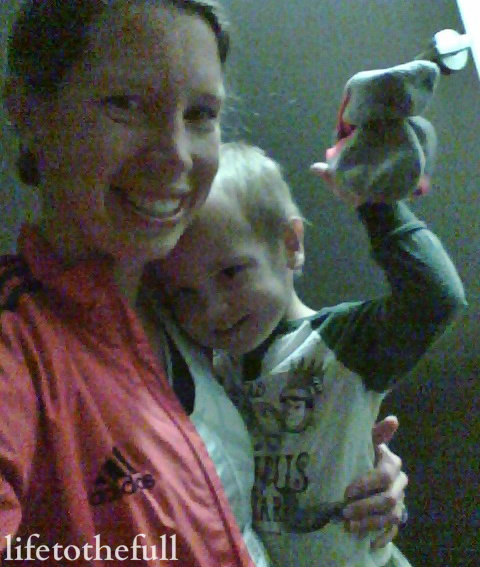 8/31 M - Easy: 4 miles with double jogging stroller, 39:54 @ 9:58. 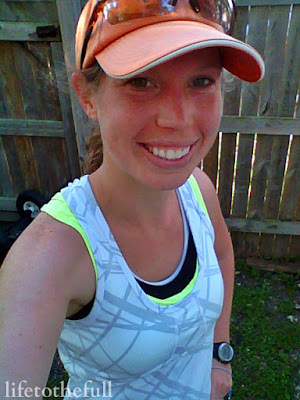 9/3 H - Tempo Run: 4 miles, 32:00 @ 8:00/mile avg + Strength Training. Still not feeling very well. 9/4 F - Off. STILL not feeling well! 9/5 Sa - Long Run: 13.75 miles, 2:00:00 @ 8:44/mile avg. 9/6 Su - 4 miles with my sis-in-law! How do you live with purpose? Hello there! 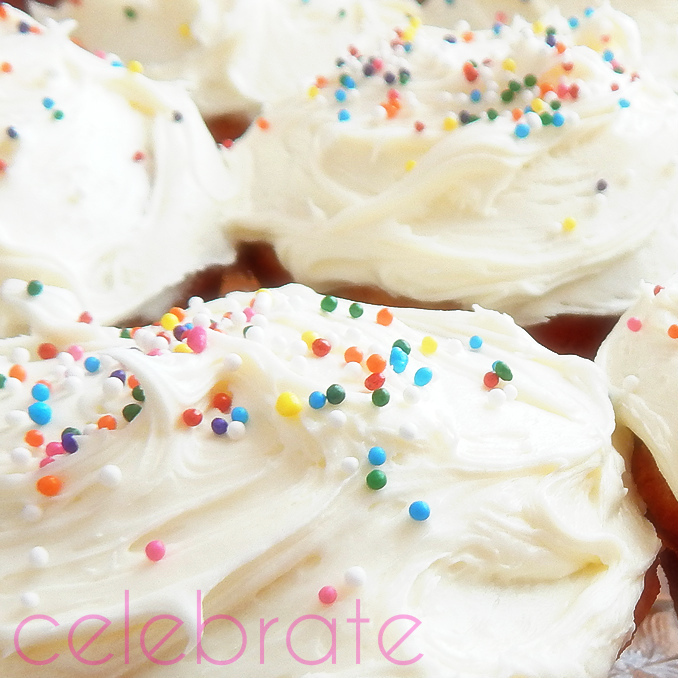 It's Five-Minute Friday link-up time. Let me tell you a little something about myself. I am petrified of singing in public. Singing in church with the congregation is fine, as long as no one hears me, but to actually sing a song in front of someone makes my stomach turn and my palms sweat profusely. I just can't do it! Yet, I sing all day to my boys. 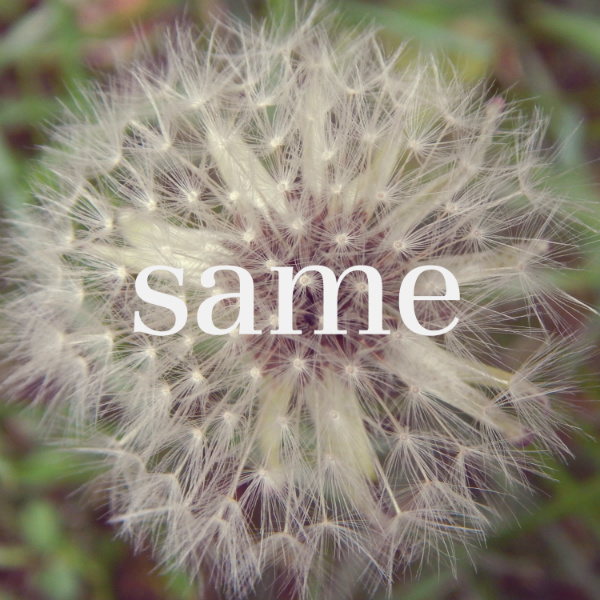 Like, ALL DAY. I didn't grow up listening to Christian music but random songs come to my mind every day and I know it's the Holy Spirit putting them on my heart. He is the only possible explanation because I don't know how I even know these songs! 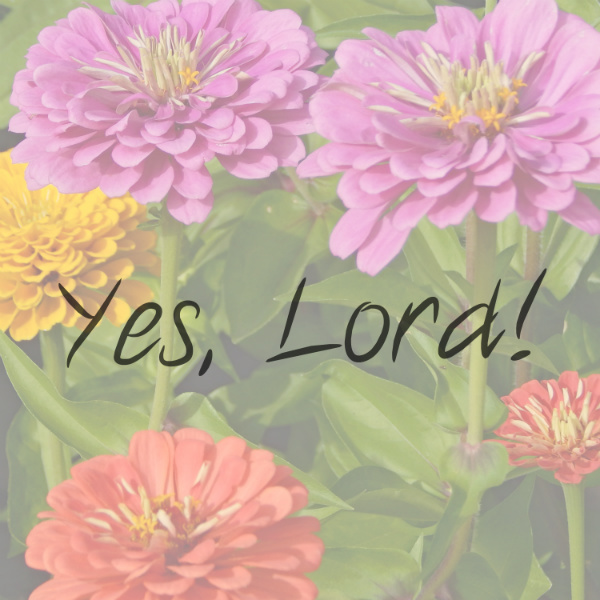 This week, E and I were singing the "yes, Lord, yes, Lord, yes, yes, Lord" song. That's the only verse I know so we sang it over and over again. He loved it! "Mama, sing yes, Lord! ", he would say. This morning I looked up the rest of the lyrics and the Lord put the verse Psalm 90:14 on my heart as well. Lately, He is saying so much to me about being satisfied in Him and choosing to live in joy. Saying "Yes" to the Lord in my life meant me leaving my career to stay home with our boys and moving to a tiny little town soon after. Saying "Yes" to the Lord has meant joining in with Bible study groups where I knew only one or two people. So many opportunities to walk boldly in faith lie in the future and I'm deciding right now to say "Yes" to the Lord; to walk boldly in His will. Saying "Yes" to the Lord means taking leaps of faith - big or little ones - and trusting in God to guide my steps. Leaving the comfort zone is never easy but God knows what is best for our lives and following Him brings such great joy! As I look back on many more of the Yes's in my life, I am reminded that God is always faithful. ALWAYS.